The impetus for Special Collections using Augmented Reality to Enhance Learning and Teaching, or SCARLET, was hinged on the principal obstacles to the use of Special Collections material in Learning and Teaching. Much of the material is isolated and separate from the secondary, supporting materials and the growing collections of digital assets, such as databases and bibliographies. The Augmented Reality (AR) application was designed to enhance the students’ experience and study of those primary source materials directly, such as the 15th century Dante editions, as well as a fragment of the Gospel of John. There is a discernible and growing demand to make these resources accessible for research, teaching and learning, and to demonstrate their relevance and value to their parent institutions and the wider HE sector. Although digitisation is often regarded as a suitable alternative, it is essential for students to be exposed to the original materials in order to recognise the materiality of the objects, themselves, as well as to help prepare them for independent research. Specifically, the project arose from the existing links between Mimas and The John Rylands University Library, demand from the University of Manchester’s teachers and students, and the technical expertise within Mimas’ Learning and Teaching team; however, the project directly addresses The Horizon Report’s emphasis of the importance of “digital media literacy [which] continues its rise in importance as a key skill in every discipline and profession”, as well as its recognition that AR would gain “widespread usage within two to three years” (HR, 2011). SCARLET addresses key learning objectives and purposes directly, by bringing Special Collections into the age of the app. Augmented Reality enables students to see and handle the original materials, while enhancing the learning experience by ‘surrounding’ the object with digital images, online learning resources and information on the items before them and on related objects held in the Library and elsewhere. AR makes the sessions more interactive, moving towards an enquiry-based learning model, where students are set real questions to solve, through a combination of close study of the original material and by downloading metadata, images and secondary reading, to help them interrogate and interpret the material. 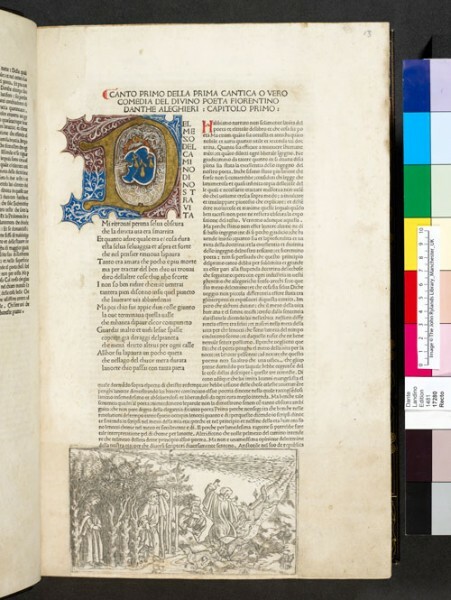 There were three key content areas in the initial design for SCARLET, and Dr. Guyda Armstrong’s “Beyond the Text: The Book and Its Body” was selected for the pilot course, developing content around 10 key editions of Dante’s Divine Comedy. With the aid of Matthew Ramirez, who worked to develop the app, all content came from Dr. Armstrong’s course materials, keeping a clear eye on how the existing resources could be integrated with the technology to ensure cohesiveness. Story-boarding was used to prepare for the range and abilities, as well as the needs of particular students-as-users: students who require access to all secondary resources relevant to a particular edition; students who want contextual materials as they consult the text; and students who only want a brief overview of the edition. From there, the development moved to considering how the technology could enhance the experience, allowing the students to access web content, the augmented resources, and/or multi-media content. 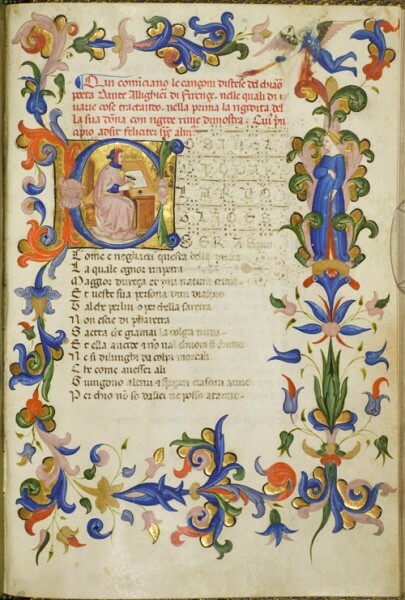 Students selected and researched a Dante book from the University’s Special Collections for their first course essay. At the same time, they were able to access SCARLET content that complemented their studies via iPads, which were made available in the Reading Room of the Library. Following on from their course work, a Focus Group was set up and run on 16 November 2011, which allowed for an in-depth discussion about content, usability and use of mobile technology for research. This formal evaluation process helped the team to assess the strengths and limitations of using AR within the context of teaching using Special Collections. SCARLET has also made a demonstration channel available so that anyone can sample limited content. At the project outset, the technical architecture and choice of software was considered integral to its success. Because the project would not be developing any technical code or services, building on existing frameworks available as open source, such as AR browsers, was deemed imperative. To build on previous Learning and Teaching Innovation Grant (LTIG) projects, such as “QR codes at Bath”, 2009 (http://blogs.bath.ac.uk/qrcode/) and “Unlocking the Hidden Curriculum” at the University of Exeter, 2010 (http://blogs.exeter.ac.uk/augmentedreality/), it was important to follow best practice and software recommendations that had been informed through their findings and technical reports. The JISC Observatory report, “Augmented Reality for Smartphones” was paramount in selecting the AR browser to deliver SCARLET’s content. Back in April, 2011, there was a proliferation of AR browsers with development APIs; however, because of the environmental constraints of the technology being used inside the John Rylands Library, the traditional format of augmented delivery – POIs (Points of Interest) mapped to GPS coordinates was problematic. Mobile devices would struggle to detect accurate location-based data with their inbuilt GPS. In some cases, they would not work at all because of compass interference. At that time, Junaio was the only AR browser capable of harnessing optical tracking functionality, linking 3D models, videos and information to images in the form of “GLUE” based channels; this ability, coupled with an open API and compatibility on Android, iOS and Nokia devices were the determining factors. Since then, other AR browsers, such as Aurasma and Layar, have launched similar functions; however, the technology within Junaio is far more mature, since it has been available to developers for over a year. It is hoped by the end of the project that the application of base-level standards will be ubiquitous across most AR browsers, thus enabling the outputs to be interoperable regardless of delivery choice. NOTE: If you would like to see it in action for yourself, download the Junaio app to a tablet/smartphone and view the demonstration content available on the SCARLET blog. An initial survey was given to students from the pilot course, “Beyond the Text”, which asks some straightforward questions in order to gauge the students’ awareness of mobile technologies in general, and Augmented Reality, more specifically. The results of that survey revealed that the students knew what mobile technologies were; however, they did not use them in any way for research and learning. The majority said that they were aware of AR, but did not know really what it was or how it could work in an educational setting. Following on from the survey, and after approximately 12 weeks into the course, a Focus Group was prepared and run on 16 November 2011; the results suggested that the students were getting a great deal from the course itself, the use of Special Collections, as well as their use of the iPads and the SCARLET app. Most stated unequivocally that they found the technology easy to use. Even the most critical of the students reported that she could see the ability to collate and create links among the different texts, as well as other areas of research, which was something the team wanted to underscore with the application. They stated that the use of AR gave them the opportunity to see and to anticipate some additional connections as they conducted research. However, the session also pointed out some initial worries students had about how the technology might work against the overall purpose of the course, whose primary aim was the encounter with the primary texts. The anxiety was that a new technology, useful though it is, could detract from the essential exercise of getting the students engaged in the material. The students exhibited a critical awareness, not just of the course’s aims and objectives, but of the usefulness and reasons for the marriage between the traditional Special Collections-type experience with the technology. The Focus Group acknowledged the fact that the app was never meant to remove the student from the experience of working in Special Collections; the physical entities remain essential to the project. Students indicated that they were satisfied with the project and anticipated that it would have additional future benefit with the remainder of the module (e.g., writing of their essays). They highlighted the fact that they recognised the importance and potential necessity in learning and conducting research with AR and the app, because of the clear indicators that those tools are part of the future direction in education and pedagogical practice. Students said that they would recommend this type of module to their friends, as long as the technology was integrated well with the material and its use was understandable and relevant to the study. Another survey and Focus Group were administered on 7 March 2012, with a group of 1st year undergraduate students. In terms of outputs, blog posts and tweets have been pivotal as a means of disseminating the work of the SCARLET team. There has also been a Technical Options Appraisal Report, a Digital Asset Register, and a video illustrating the prototype of the user journey (available on YouTube); there have also been communications and dissemination plans, including: liaising with software developers at the Augmented Planet Conference, the ELI 2012 Annual Meeting in February, and the CNI conference in April 2012. Articles were submitted and accepted to both CILIP Update (February 2012) and SCONUL Focus (forthcoming). 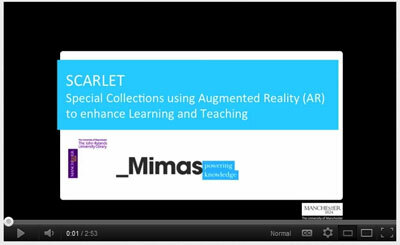 In addition, SCARLET was discussed at the Educational Technology Research Group Seminar at the University of Manchester (October 2011), the Mimas JRUL Liquid Lunch (October 2011), the JISC Online Conference Activity Week (November 2011) and at Patrima-Foundation des Sciences du Patrimoine in Paris (November 2011). Following on from Dr. Armstrong’s work, a different course with 1st year undergraduates is in place, as well as plans for two additional modules: one focused on using AR with Milton’s Paradise Lost (Dr. Jerome de Groot) and another on a fragment of St. John’s Gospel (Dr. Roberta Mazza). In addition, SCARLET is working with the Library on a short-term project beyond the remit of the existing SCARLET project in order to test the concept of AR with a wider audience. This particular undertaking is designed to create another AR app in order to assess the value of AR and its potential to improve the understanding of an object within the Library and to assess whether the use or AR can improve the visitor experience. The ancient and restored printing presses, featured throughout the building, will be the centre-piece of this part of the project. In addition, a SCARLET Toolkit is being developed. This aims to assist others in the creation of projects using Augmented Reality in any context. A methodology that can be easily replicated within other contexts is a key driver in order to benefit others who want to develop AR applications to support teaching and learning. As SCARLET progresses, we expect that lessons learned from development can be successfully applied to the wider teaching and learning community. The team sees great potential in applying SCARLET principles across a broader range of subject areas, and we are looking for opportunities to exploit this technology further. There’s already interest from disciplines such as medicine, and we’d like to encourage others to get in touch with us.